Stratagem: Increases Target's ATK by 1.3x and cannot be targeted by enemies for 20s. Increases Range by 20 for all Castles, Tono, and Tokens. Increases Range by 25 for all Castles, Tono, and Tokens. Decreases Damage Dealt by 15% for all enemies. ※ 「中ノ門堀」 can only be equipped by Ranged castles and cannot be [Crafted] or found from warehouse drops. ※ 「中ノ門堀」 may be obtainable again in the future. ※ The facilities with (Melee) and (Ranged) attached to them can only be equipped by their respective Melee/Ranged castles and can be [Crafted] and found from warehouse drops. Certain Castles have had their Skill or Stratagem description text adjusted. Certain weapons have had their description text adjusted. → Weapons with [Increased/Decreased ASPD] have had their descriptions changed. There is no change to their performance. Certain facilities have had their description text adjusted. → There is no change to their performance. All users who participated in the [DMM Games Summer Vacation Support Campaign] have received 1x [Six Star Prayer Stone] and 2x [Tsubasa [Toku]] in their present box. Fixed a bug where the tutorial text after clearing CHapter 2 would display incorrectly. ■ Daily 1x Spirit Orbs and 2x Tsubasa presents! ■ [Added Bonus] for 1000 & 3000 DMMpt Spirit Orb First Purchase! During the campaign, purchase the 1000 or 3000 DMMpt Spirit Orb package for the first time to receive bonus Spirit Orbs. Furthermore, the 1000 DMMpt package will include Kawagoe-jou's motif facilitiy ★4施設「中ノ門堀(堀)」. The 3000 DMMpt package will include a [Five Star Prayer Stone] which guarantees a ★5 Castle, and a Tsubasa [Toku] which gives a very large amount of EXP to level up a castle. There is an increased chance of [★5 Kasugayama-jou], [★4 Edoshi-yagata], [★3 Shikano-jou] appearing. Last edited by Folseus; 09-11-2018 at 07:51 AM. 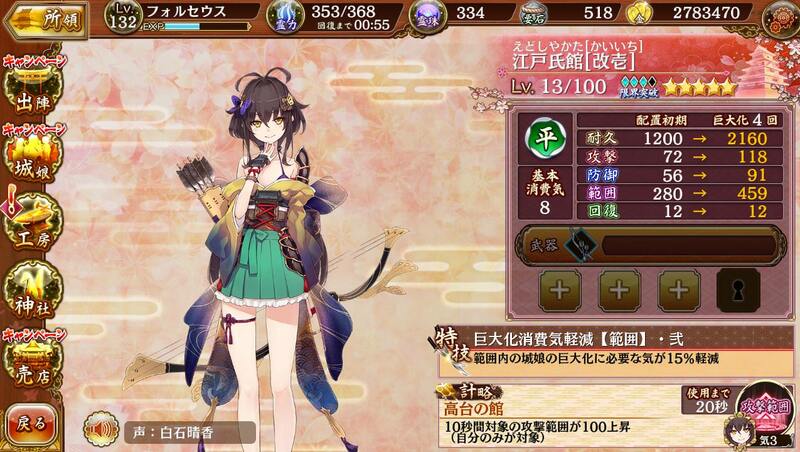 Can only droll at Kasugayama for now, 10 consecutive super construct yield nothing. Got Kano, truly needed a castle with Ki regen, but Sawayama already occupied the spear pos. 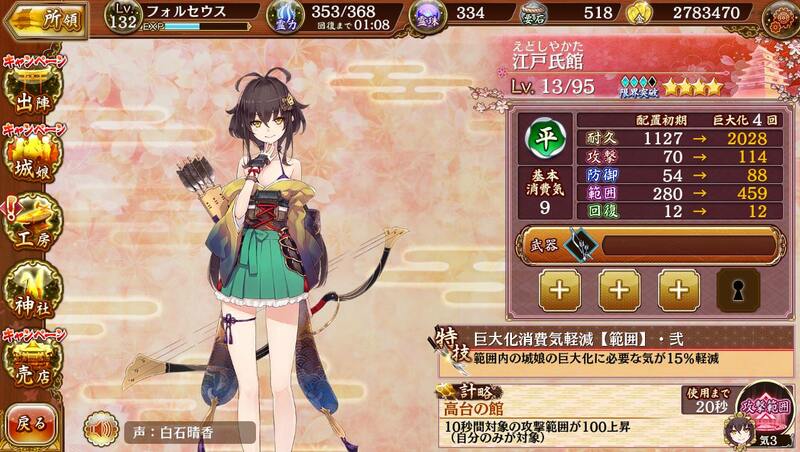 Etoshi look insteresting too, if I can clump together 3-4 high cost shiromusu, she basically a free bow. Last edited by Nattō; 09-12-2018 at 04:20 AM.